We've had a few podcast listeners request that we do an episode where we discuss the potential issues for friendly fire during deadly force encounters. 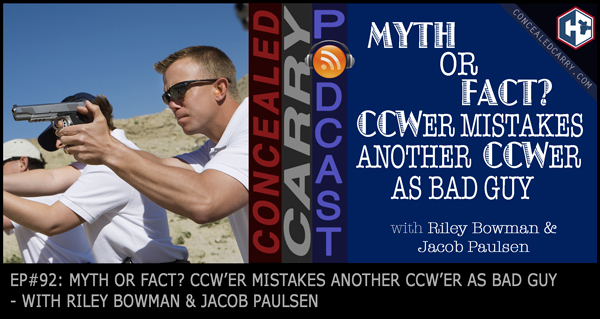 While these sorts of situations are EXTREMELY rare (we, to date, have not been able to find one single instance where one concealed carrier shot another mistaking them as the bad guy while trying to stop a threat), this is still a relevant topic that Riley and Jacob provide some insight and suggestions on. Tune in! I’ve tried to enter the contest several times, & have been repeatedly told that my captcha code did not match,even though my code was an exact match. Can you fix this? Steven, I’ve just manually added you to the list of entries. Sorry for the issue. We’ve had a few hundred people enter now so I’m not sure what the issue is but I’ll look into it further! The only time that I’ve had to use lethal force, the problem of friendly fire never came up. However, if you keep your head and awareness, it should be of the most remote of happenings. Keep your powder dry and your metal oiled. Be safe and aware. Knock off the background “music.” I don’t need to shuck and jive while I’m trying to listen to a serious discussion. The narration is hard enough to understand as it is. Warren, sorry you feel that way. We only have any music playing in the first few minutes and the last minute of each episode.